Andrew J. Oxenham is a Distinguished McKnight University Professor in the Departments of Psychology and Otolaryngology at the University of Minnesota, where he directs the Auditory Perception and Cognition Lab. 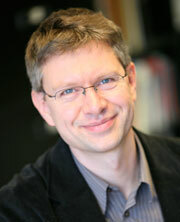 Before coming to Minnesota in 2006, he was a Principal Research Scientist at MIT’s Research Laboratory of Electronics. His research interests include auditory and speech perception in normal, impaired and electric hearing. He has published over 120 scientific journal articles and 25 book chapters in areas ranging from the perceptual correlates of cochlear amplification and compression, through pitch perception, to neural correlates of auditory awareness. He has served as associate editor for some of the field’s leading journals, including the Journal of the Acoustical Society of America and the Journal of the Association for Research in Otolaryngology. He is the founding editor-in-chief of the journal Trends in Hearing. His research has been continuously supported from the National Institutes of Health since 1998. McDermott, J. H., Lehr, A. J., and Oxenham, A. J. (2010). Individual differences reveal the basis of consonance. Current Biology 20, 1035-1041. Micheyl, C., and Oxenham, A. J. (2010). Pitch, harmonicity, and concurrent sound segregation: Psychoacoustical and neurophysiological findings. Hearing Research 266, 36-51. Oxenham, A. J., and Simonson, A. M. (2009). Masking release for low- and high-pass filtered speech in the presence of noise and single-talker interference. Journal of the Acoustical Society of America 125, 457-468. Elhilali, M., Ma, L., Micheyl, C., Oxenham, A. J., and Shamma, S. (2009) Temporal coherence in the perceptual organization and cortical representation of auditory scenes. Neuron 61, 317-329. Wojtczak, M., and Oxenham, A. J. (2009). Pitfalls in behavioral estimates of basilar membrane compression in humans. Journal of the Acoustical Society of America 125, 270-281. Gutschalk, A., Micheyl, C., and Oxenham, A. J. (2008). Neural correlates of auditory perceptual awareness under informational masking. PLoS Biology 6, 1156-1165 (e138). McDermott, J. H., and Oxenham, A. J. (2008). Spectral completion of partially masked sounds. Proceedings of the National Academy of Sciences USA 105, 5939-5944. McDermott, J. H., Lehr, A. J., and Oxenham, A. J. (2008). Is relative pitch specific to pitch? Psychological Science 19, 1263-1271.